Rep. Mike Rogers ignores the expansion of the drone war and growth of unconstitutional surveillance. 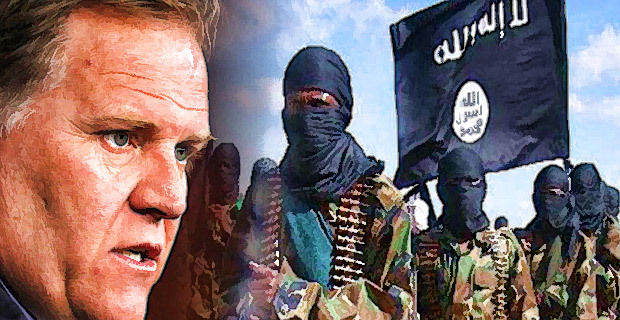 During an interview with Time posted on Thursday, retiring House Intelligence Committee chairman Mike Rogers said the Obama administration has pursued a “kinder, gentler approach” to the war on terror. Pressed for details, Rogers said he is not authorized the divulge specifics. He said, however, under Obama the United States has “taken people off the battlefield that have been disruptive” to the ability of al-Qaeda to plan and carry out operations. Mr. Rogers omitted the fact Obama has significantly expanded the use of drones, first introduced by his predecessor, and has not closed the concentration camp located Guantanamo Bay, as promised when he ran for president. Upon taking office in 2009, Obama “almost immediately made drones one of his key national security tools. By mid-April 2013, he had already authorized 307 strikes in Pakistan, six times more than the number of strikes carried out during President Bush’s entire eight years in office,” notes Peter Bergen, the director of the National Security Studies Program at the New America Foundation. Moreover, as admitted by Bush’s NSA director, Michael Hayden, unconstitutional surveillance programs have “expanded” under Obama. This should be a fact Rogers is keenly aware of as the chairman of the House Intelligence Committee. Apart from al-Qaeda, Rogers said cyber terrorism is the “biggest national-security threat I’ve ever seen, one that we’re not prepared to deal with.” He said reducing the size of the U.S. military “has said to countries they can invade their neighbors without fear of retribution.” Rogers said Iran and its “interest in getting a nuclear weapon” also poses a threat. Rogers appears to be uninformed on the subject of Iran and nuclear weapons. In 2012, U.S. intelligence agencies unanimously concluded Iran had earlier abandoned an effort o construct a nuclear weapon. James Clapper, the director of national intelligence, and David Petraeus, the former director of the CIA, told the Senate in January, 2012, there is no evidence Iran is working on a nuclear weapon.